Buy cherry tree Prunus avium Stella for sale online from UK specialist suppliers of garden fruit trees. Stella Cherry (Prunus avium 'Stella') is a very popular dessert cherry. 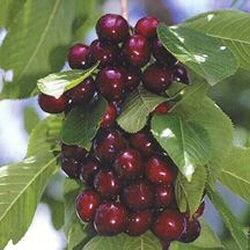 It is self-fertile variety which means there is no need for another cherry tree to guarantee a crop of cherries. Stella is a very dependable cherry variety and produces excellent yields of large sweet dark red cherries.